Negotiators in Poland have finally secured agreement on a range of measures that will make the Paris climate pact operational in 2020. Last-minute rows over carbon markets threatened to derail the two-week summit - and delayed it by a day. Delegates believe the new rules will ensure that countries keep their promises to cut carbon. The Katowice agreement aims to deliver the Paris goals of limiting global temperature rises to well below 2C. 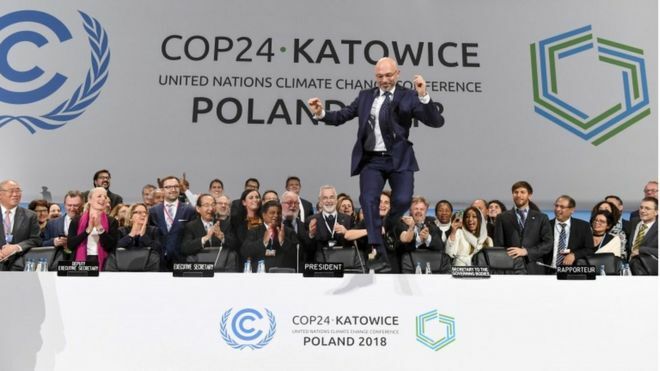 "Putting together the Paris agreement work programme is a big responsibility," said the chairman of the talks, known as COP24, Michal Kurtyka. "It has been a long road. We did our best to leave no-one behind." What did the delegates focus on? The summit accord, reached by 196 states, outlines plans for a common rulebook for all countries - regulations that will govern the nuts and bolts of how countries cut carbon, provide finance to poorer nations and ensure that everyone is doing what they say they are doing. Sorting out the rulebook sounds easy but is very technical. Countries often have different definitions and timetables for their carbon cutting actions. Poorer countries want some "flexibility" in the rules so that they are not overwhelmed with regulations that they don't have the capacity to put into practice. A deadlock between Brazil and other countries over the rules for the monitoring of carbon credits threatened to derail the talks. Brazil had been pushing for a weaker set of rules on carbon markets, despite strong opposition from many other countries. These discussions have now been deferred until next year. Further tensions emerged last weekend, scientists and delegates were shocked when the US, Saudi Arabia, Russia and Kuwait objected to the meeting "welcoming" a recent UN report on keeping global temperature rise to within the 1.5C limit. The report said the world is now completely off track, heading more towards 3C this century. In a compromise, the final statement from the summit welcomed the "completion" of the report and invited countries to make use of it. Laurence Tubiana, a key architect of the Paris agreement, and now with the European Climate Foundation, said the agreement was a big boost for the Paris pact. "The key piece was having a good transparency system because it builds trust between countries and because we can measure what is being done and it is precise enough," she told BBC News on the sidelines of this meeting. "I am happy with that. Nobody can say that's not clear, we don't know what to do, or that it's not true anymore. It's very clear,"
She said that countries like Russia- which had refused to ratify the Paris agreement because it wasn't sure about the rules - could no longer use that excuse. However some observers say the deal is not sufficiently strong to deal with the urgency of the climate problem. In the words of one delegate, "it's what's possible, but not what's necessary". There has been a big push for countries to up their ambition, to cut carbon deeper and with greater urgency. Many delegates want to see a rapid increase in ambition before 2020 to keep the chances of staying under 1.5C alive. Right now, the plans that countries lodged as part of the Paris agreement don't get anywhere near that, described as "grossly insufficient" by one delegate from a climate vulnerable country.